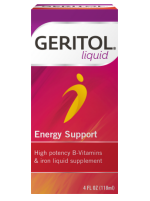 Geritol® liquid is a liquid vitamin to be taken once daily as a supplement to your meal, just like a regular daily multivitamin. Take 1 tablespoon (½ fluid ounce) of Geritol® liquid daily after a meal or as directed by a doctor. Use the Geritol dosage cup that is included in the package.